Our maple season begins in February when we tap the trees. After drilling a small hole, a spout is inserted into the tree. When the weather turns to freezing nights and thawing days, a small part of the tree’s sap runs out of the tree through the spout. 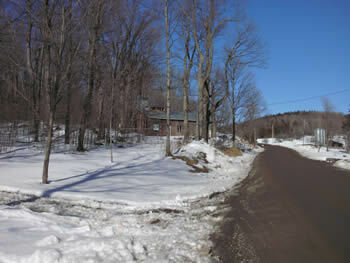 Once we have collected several thousand gallons of sap, we are ready to make pure maple syrup. Getting from sap to syrup is a process of removing water from the sap. Nothing is added and only water is removed during this process. Since it takes about 40 gallons of sap to make one gallon of syrup, we start by pumping the sap through a reverse osmosis machine that removes about two thirds of the water. This green technology allows us to make syrup using less energy. The partially concentrated sap is then boiled in the evaporator until it reaches the correct density to be maple syrup. This is the trickiest part of the operation requiring a good bit of skill and experience. Once the syrup reaches the correct density, the syrup is filtered and then put into jugs for retail or into stainless steel barrels for storage. 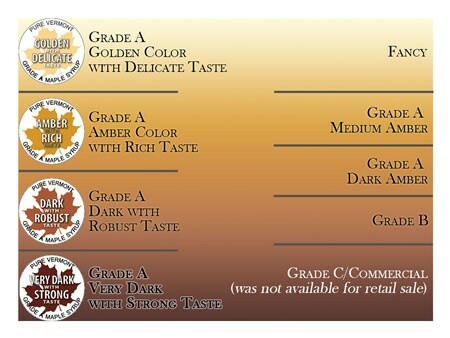 Vermont maple syrup producers have started using a new grading system that provides a better description of each grade, or class, of syrup. Each grade gives a color and a flavor description. This chart shows a comparison of the old system with the new.